Dog parks are becoming more popular all across the United States. They range in size and design but all share the same purpose: to provide a place where dogs can run freely off-leash and socialize with other dogs. Although they’re not for everyone, dog parks can benefit both people and their pets. Read on to find out if a trip to the dog park is right for you and your dog as well as what to do before you visit and once you’re there. Many behavior problems in dogs are caused by a lack of physical and mental activity. Dogs were born to lead active lives. They’ve worked alongside people for thousands of years, hunting game, herding and protecting livestock, and controlling vermin. Dogs’ wild relatives lead busy lives, too. Their days are full of hunting, scavenging, avoiding predators and complex social interaction. Most pet dogs, on the other hand, spend the majority of their time alone at home, napping on couches and eating food from bowls—no hunting or scavenging required. Many become bored, lonely and overweight. They have excess energy and no way to expend it, so it’s not surprising that they often come up with activities on their own, like unstuffing couches, raiding trash cans and gnawing on shoes. Daycare for dogs is becoming more and more popular across the nation. The daycare facilities range from very small 1,200 sq ft facilities to expansive warehouse facilities, to indoor/outdoor facilities, some of which have multiple acres for the dogs to run. Fees range according to the size of the facility, the services offered, and geography. Orange County, California has an average per day fee of $35.00, while Orange County, FL has an average of $18.00 per day. Dog daycare is an excellent way to exercise dogs, especially large dogs. Many dogs whose owners work full time are cooped up most of the day. Some of these dogs are in a crate all day. Then when the owner arrives home, exercise can be as little as a brief walk outside to eliminate. Lack of exercise can lead to obesity, lack of overall fitness, mental boredom, and behavior issues. A dog that has spent 8 hours playing with other dogs comes home exhausted. A tired dog, like a tired child, goes to bed without a fuss and sleeps through the night. This avoids the dog “bothering” the owner continuously asking to play, and the owner becoming frustrated, or ignoring the dog. This can also prevent some problem behaviors that arise from boredom and excess energy. Dogs that are introduced at a young age to dog daycare have better social skills. These dogs learn how to interact with other dogs. Normal dogs that regularly attend dog daycare view most other dogs as playmates, until the other dog signals otherwise. Additionally, dogs that regularly attend daycare learn independence from their owner. These dogs are exposed to other humans, and can become less likely to view strangers as a threat. Also, normal dogs may be less likely to develop separation anxiety. Dogs that are exposed to multiple environments, and many social situations, tend to handle new situations in a more confident manner. Many daycare facilities also offer 24 hour daycare, or overnight boarding. This is an excellent option for pet owners as the dog already associates the facility with good things. Leaving the pet overnight is less traumatic for the dog, and the owner. The pet is exhausted after playing all day, and falls asleep more easily then when being boarded in a typical boarding kennel. The owner feels less guilty about leaving the dog at that facility knowing this. Also, dogs often get couches to sleep on at night, in their own room, rather than being caged. All this is much more positive for the owner as well as the dog. Another nice service some facilities offer is the ability for the owner to check in on their dog by going to the web site and viewing live action video via webcams. Whether an owner is at work, or on vacation cross the country, the owner can see their dog and be assured their pet is OK by going to the daycare’s website. All these aspects of daycare for dogs help the owner form a stronger bond with their pet because the pet causes fewer “problems” for them, and is “less work without the guilt”. The dogs go to sleep when they get home, and the owner feels they have done a good thing for their dog. This is a positive feeling instead of the owner getting frustrated with the dog because all it wants to do is play and the owner is tired from work and wants to be left alone. There are things to watch out for, however. The wrong daycare can lead to serious behavior problems or injury. Owners should tour the daycare and watch the staff interacting with the pets. • Is there a staff person watching each group of dog’s playing? • Does the staff person stop dogs whose interactions are getting out of hand? • Does the staff person clean up immediately after a dog has eliminated? • Are the dogs separated into groups based on their preferences (who gets along) rather than just size? • If dogs spend time outdoors, are they rotated inside to cool down? • Is there shade provided outside? • Adequate water? • Supervision outside? • Is there adequate supervision for the number of dogs in a group? • Is the flooring an adequate surface for the dogs to safely run, play and jump, while being able to be sanitized? • What are the requirements for a dog to spend the day? Is the dog evaluated for ability to play well or aggression? • Do they require that all Vaccinations be current? • Does the staff understand dog body language, play, aggression, etc. and is the staff able to read signals well enough to prevent injury? • Is your dog happy to be there? If your dog is going regularly to the facility, and is not excited to go inside when you arrive in the parking lot, then you need to find another daycare. The first couple visits the dog may be hesitant at the reception area. However, the dog should start to interact after a few minutes of acclimation. A good facility will introduce a new dog only to a group of dogs that are known to play very well with others, and who do not have social issues. In summary, the right dog daycare facility can prevent dog weight problems, increase the dog’s ability to interact with others, work the dog’s mind as well as muscles, enhance the dog’s overall wellbeing, prevent behavior issues, and strengthen the bond between the dog and its owner. Dr. Frances Vaujin, DVM, is the Medical Director of Luv My Pet, Inc., the nation’s largest provider of low cost pet vaccination clinics (partnered with Petco in 23 states), and is the owner of and head veterinarian at Heroes Veterinary Service, a full-service pet facility in Broward County, Florida. In Florida, as in most of the country, heartworm preventative is a must for every dog. It needs to be started at a young age and continued every 30 days throughout the dog’s lifetime. There are different types of prevention; it just depends on what works best for you and your pet. Since heartworms are spread through mosquitoes, in warm climates it is always best to keep your pet on preventative year round. Heartworm checks, done by a blood draw at your veterinarian, are recommended at least every year. Never split a pill in half as the preventative is not spread equally throughout the pill. Let me explain a little how the heartworm cycle works. A mosquito bites a dog that has baby heartworms, the heartworms incubate in the mosquito until teenagers; the mosquito then bites a dog and incubates for the next 6-7 months in the dog until adults. That is one of the reasons that heartworms do not show up as soon as a dog is bitten. 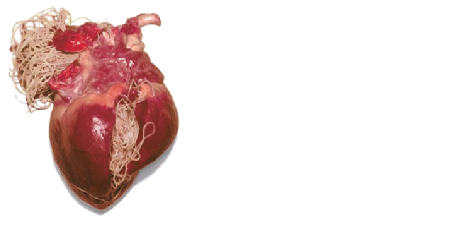 The heartworms grow in your dog, basically squeezing the heart and preventing it from performing in its normal capacity. Symptoms of heartworms range from lethargy, difficulty breathing, enlarged abdomen to coughing or not eating. Heartworm disease can be treated but at a very costly rate and over an extensive period of time with multiple treatments, depending on how severe the infestation. Heartworm disease can recur if no preventative is given even after a heartworm treatment. See your veterinarian for more information about heartworm disease and prevention for your dog. And yes, cats can get heartworms too. If your dog seems lazy, is reluctant to run or play or even get out of bed, especially the day after exercising, he may be suffering from arthritis. Other signs can include stiffness when getting up, limping, obvious pain, reluctance to jump or go up or down stairs, irritability, diminished muscle tone and amount (due to lack of use), loss of appetite (often due to pain or to difficulty reaching down to the bowl to eat), and even fever. It's easy to dismiss such changes as inevitable signs of aging, but don't assume your dog has arthritis unless your veterinarian has checked him. They could be caused by another problem that needs to be addressed. About 65 percent of dogs between the ages of 7 and 11 years have some degree of arthritis, with a greater proportion occurring in heavier and larger dogs. But while arthritis is more common in older dogs, it can appear in dogs of almost any age. Very commonly, an injury to a joint will lead to early onset of arthritis in that joint. Canine hip dysplasia often leads to arthritis in the rear and can cause so much pain the dog has difficulty walking. Even some infections and diseases can lead to arthritis. In some dogs there is no obvious cause. In others abnormal stresses or trauma to the joint can cause degeneration of the joint cartilage and underlying bone. The synovial membrane surrounding the joint becomes inflamed and the bone develops small bony outgrowths called osteophytes. These changes cause the joint to stiffen, become painful, and have decreased range of motion. In cases in which an existing condition is exacerbating the arthritis, surgery to remedy the condition is warranted. When considering surgery for a joint problem, keep in mind that the more the joint is used in its damaged state, the more arthritis will occur. Even though the surgery may fix the initial problem, if too much damage has occurred the dog will still be plagued with incurable arthritic changes. Prevention of arthritis is the key. Conservative treatment entails keeping the dog’s weight down, attending to injuries, and maintaining a program of exercise. Low impact exercise such as walking or swimming every other day is best for dogs with signs of arthritis. Provide a soft bed with lots of thick padding for sleeping. A warm bed often helps the joints feel better. Massage can also be helpful. We want the holidays to be a happy time for you and your pet, not a time for an emergency visit to your veterinarian. The food and decorations that make the holidays so much fun for us can be dangerous for your pet. We do not want this article to dampen your spirits but we do want you to be aware of the dangers and plan carefully to avoid these potential hazards. For more information on Decorations & wrappings, gifts under the tree and other items to be concerned about during the holiday season go to: http://www.peteducation.com/article.cfm?c=2+2098&aid=932 or our website to connect to the entire article. Ah, the sights, the sounds and the smells of the holidays! For some dogs, the holidays are a cornucopia of joy. A friendly dog loves the hustle and bustle; new people, new things and, best of all, good food stream into the house. For all he knows, the show is being put on for his benefit. It's like a never-ending car ride. The real question is...do dogs experience holiday stress like we do? The holidays put a lot of stress on everyone involved, some of it good and some of it bad. Our pets have to withstand any number of unusual circumstances that are novel each year because they don't have the chance to get used to them. Do dogs experience stress? We believe they do.  A constant stream of company.  Kenneling. The other side of traveling during the holidays is putting dogs into a kennel. For a dog, a good kennel should be like vacation, with a lot of activities to keep him occupied (although he's still going to miss you like mad). So what can you do to ease the burden? Three words: routine, routine, routine. Keeping as close as you can to your pet's normal schedule is the best antidote to holiday stress. Stay consistent with feeding times and amounts, and be on guard against illegal snacks. Maintain his exercise, walking schedule and playtime. A tired pet is a happy pet. This advice, by the way, goes for people too. Exercise is a great stress reliever. If time is precious, combine your exercise with your pet's by setting aside a specific amount of time each day – 20 minutes for instance – for you both to play and work up a little healthy sweat. Staying in shape improves attitude and behavior in pets and people. Holiday Stress...Does it affect your dog too? I will not, absolutely will not, allow anyone to put a ribbon on my head or dress me up in dog clothes! clients getting sick. However, as with people colds, airborne germs can affect dogs too. Also keep in mind that there are so many different strains of the flu and Bordetella that even getting the vaccine doesn’t completely defend you from all strains. It’s Cold and Flu Season for your dog too! Dog colds, also called upper respiratory infections are a common ailment that can affect any dog. 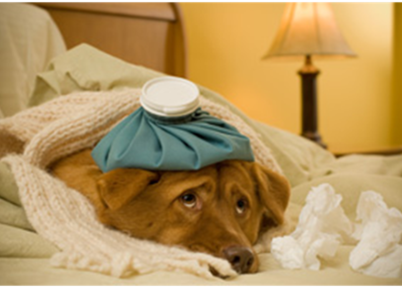 Colds in dogs are very similar to the types of cold humans get, but are specific to dogs only. They are caused by viruses or bacteria spread from other animals. Just like you, a dog can become more susceptible to colds if they are exposed to stresses and their immune systems cannot ward off an attack from a virus or bacteria. Most dog colds will often clear up on their own once the dog’s immune system is back at full strength. However, untreated cold symptoms can lead to more serious health problems, and other serious dog health conditions can present in your dog as simple cold symptoms. Proper treatment of your dog’s upper respiratory infections is crucial to maintaining your dog’s overall health, and to keep him happy and comfortable as well. Determining that your dog has a common cold is relatively simple, as the symptoms are often very similar to the signs you get when you have a cold. Dogs with colds may have sneezing, coughing, runny noses or eyes, congestion, and may also display a lack of energy or decreased appetite. These symptoms are caused by a variety of viruses and bacteria, such as the parainfluenza virus, Adenovirus type-2 virus and bordetella bronchiseptic bacteria. All of these microorganisms are contagious and spread in environments where dogs come into contact with one another. Any time that your dog has been around other dogs he may become infected with these bacteria or viruses. Kennels, pet stores, dog parks or shelters can all be hotspots for your dog to get sick. Because upper respiratory infections affect a dog’s bronchi, trachea and sinuses, he also may have difficulty breathing. Judging whether your dog’s cold symptoms warrant a trip to the vet’s office requires that you understand your dog’s medical condition and the dangers to his health from these conditions. Very young puppies, older dogs or dogs with compromised immune systems are more vulnerable to the problems presented by upper respiratory infections, so it is best to have a vet check up if your puppy or dog displays symptoms of a cold. Severe difficulties with breathing or long term lack of appetite are also signs that you should bring your dog in to the vet. Sometimes dogs will develop a more serious condition from an upper respiratory infection that has not been treated properly, such as pneumonia, or an inflammation of the lungs. Pneumonia is very dangerous to dogs and should be treated immediately. Often common cold symptoms in dogs will begin to clear up or lessen in a few days, but there are also other conditions that may first present symptoms that resemble those of the common cold but last longer and may need more advanced treatment. A constant, raspy cough often accompanied by phlegm like discharge is usually referred to as canine kennel cough. Other symptoms related to this problem resemble those of the common cold. This condition is highly contagious and is caused by the bordetella bronchiseptic bacteria and the parainfluenza virus and possibly other agents as well. It can result in your dog feeling sick for up to 20 days in severe cases. Distemper is another serious illness that often shows up with cold like symptoms but progresses into a multisystem disease affecting the gastrointestinal tract and central nervous system. It is incurable and often fatal. The virus that causes distemper is known as canine distemper virus or CDV and is very contagious. Luckily there is a vaccine to prevent this disease. Treatment for dog colds may be performed at home if the case is not too severe. No one likes to be sick, including your dog so help him out by making him as comfortable as possible. Make sure that he gets plenty of fluids and stays warm and dry. Cold weather can really affect dogs with colds. Many of the human treatments for colds work well for dogs too. Some warm chicken soup or brown rice can help if he doesn’t feel like eating and getting a lot of sleep will help boost his immune system. Never give your dog human cold medicines. Colds will often clear up after a few days rest, but keep a watchful eye to make sure that his conditions do not get worse. In severe cases your vet may choose to treat your dog with antibiotics to remove the bacterial infection. Antibiotics do not work against viruses, but may help in preventing secondary bacterial infections that may slow down his healing process. There are also several homeopathic remedies that may help out your sickly dog. Ferrum phos, kali sulp and magnesium phosphate are all herbs known to aid in recovery as well as eastern purple coneflowers and ribwort plantains. Preventing a common dog cold from becoming a more serious condition can be accomplished through a proper vaccination program outlined by your vet. Canine distemper, Kennel cough, Adenovirus type 2 and Parainfluenzia all have vaccines available. Getting your new puppy properly vaccinated and keeping up with the yearly vaccination schedule afterward will help prevent your dog from getting a potentially life threatening condition. Everybody gets the common cold from time to time. Learning to recognize the signs and symptoms will help you keep your dog comfortable and happy and back on track in no time. dangers and sources of stress for your dog. Just remember to keep your dog safe from these Halloween hazards. Remember that human treats are not usually good for dogs! Candy - especially chocolate - can be extremely toxic to your dog. Artificially sweetened candy, gum and other goodies may also contain xylitol, a highly toxic substance. Dogs may also ingest food wrappers, causing a risk of choking, upset stomach or gastrointestinal blockage. Various party snacks can be too salty and may contain ingredients that can poison your dog. Alcoholic beverages and dogs do not mix - they pose a significant risk of severe illness or even death! Keep all of these "human goodies" far out of your dog's reach. If you are not positive that you can keep your dog away from these hazards, then consider confining your pet to another area of your home during the festivities. Keeping appropriate dog treats around for your dog can be a great idea, but remember not to overfeed. Sliced carrots or apples (hold the caramel) can be tasty and healthy snack alternatives for people and dogs alike! Some dogs really enjoy getting dressed in costumes - they might ham it up and revel in the attention. Other dogs can become scared or uncomfortable in clothing of any type. If you want to dress your dog up, start simple and see how she handles it. If she does not like it, then don't push the issue. Try a Halloween bandanna or collar instead. If your dog does seem to enjoy getting dressed up, be certain you choose a costume that fits comfortably. If it is too tight, it could cut off circulation or cause sores to develop. Loose-fitting outfits can trip your dog or get caught on objects around the house. Because of these potential dangers, never leave your dog unattended in the costume. She could become injured or may ingest parts of the costume and choke, become sick, or develop gastrointestinal blockage. For the complete article please go to: http://dogs.about.com/od/caringfordogsandpuppies/qt/halloweensafety.htm or go to our website and click on the link. Recently, several veterinarians in Ontario have reported cases of dogs that have been showing signs similar to Fanconi syndrome. All dogs in the reported cases had been fed chicken jerky treats that were manufactured in China. Signs of Fanconi syndrome can include decreased appetite, decreased activity, vomiting, and increased water consumption and/or increased urination. Blood tests may show increased urea nitrogen and creatinine. Urine tests may indicate Fanconi syndrome (increased glucose). The problem is that this can be confused with diabetes. This is an uncommon condition. It affects the kidneys and causes them to leak glucose (sugar) and other electrolytes into the urine. Dogs that have this condition will usually be very thirsty and will urinate excessive amounts. The most common finding in laboratory tests is that the dog has glucose in the urine, but has a normal blood glucose level.